A seven-year-old girl was killed in Colusa, California when a large TV set fell off a stand and hit her head. Police have not yet identified the girl, but they say she was trying to move the TV with her brother in the parish office conference room of Our Lady of Lourdes Church. The girl and her brother were at the church with two other siblings and their mother, although she was not present in the room when the terrible accident happened, according to local CBS Sacramento. Several of the little girl’s four brothers and sisters were at the horrific scene, however, which took place around 1 p.m. Tuesday. Another parishioner of the Catholic church who said she knows the family told CBS: ‘I’m crushed for them, it’s very upsetting’. According to the local station, the father of the little girl is a well-known doctor in the community, and the mother is a devoted volunteer to the parish. There’s more and a short video here. Officials at Our Lady of Lourdes Catholic Church in Colusa on Wednesday urged everyone in town to keep the Meraz family in their thoughts after the tragic death of Kateri Meraz. The 7-year-old girl was hit on the head Tuesday by a falling television as she tried to move the cart on which it was sitting so she and her brother could see the screen better. “Please continue to keep the Meraz family in your prayers,” the Rev. Arbel Cabasagan said in a statement released Wednesday. Meraz is the daughter of Dr. Antonio and Rocio Meraz. An autopsy Tuesday revealed the cause of death as blunt force head trauma, the Colusa County Coroner’s Office reported. It has been ruled an accidental death. 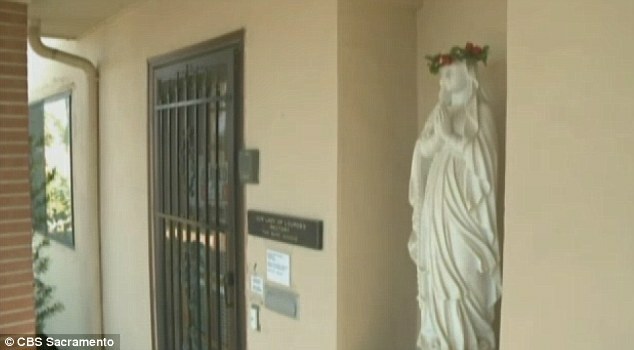 Meraz was at the Our Lady of Lourdes Catholic Church rectory where her mother is a volunteer. She and her brother were in what was described as a conference room watching television. The young girl apparently was trying to turn the TV so she and her brother could better see the screen when the TV fell from the cart and struck her in the head, the police reported. U.S. Army Major General Daniel B. Allyn, (front) commander of ISAF Regional Command (East) salutes during a memorial ceremony in forward firebase Joyce in Kunar province, July 7, 2011. Four U.S. Army soldiers, Lieutenant Dimitri Del Castillo, Staff Sergeant Nigel Kelly, Specialist Levi Nuncio and Specialist Kevin Hilaman, two Afghan National Army soldiers, an Afghan linguist and Agdar, a military sniffer dog died during operations in Kunar district in the last week of June 2011. U.S. Army Major General Daniel B. Allyn, commander of ISAF Regional Command (East) takes part during a memorial ceremony in forward firebase Joyce in Kunar province, July 7, 2011. 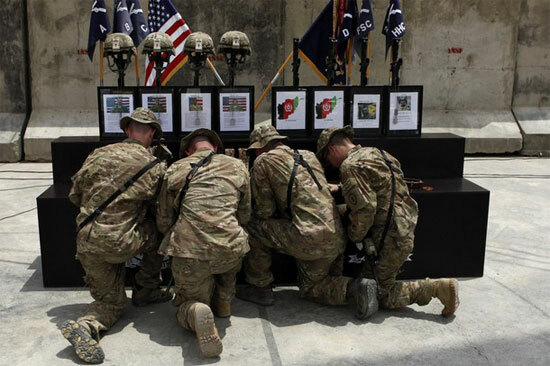 The dog collar belonging to Agdar, a military sniffer dog who died during operations in Kunar district, is displayed during a memorial ceremony in forward firebase Joyce in Kunar province July 7, 2011. The Crystal Cathedral would provide an instant, 3,000-seat architectural landmark at roughly half the $100 million that was estimated for construction of a new site in Santa Ana. A new and intriguing prospect for the Crystal Cathedral emerged Wednesday when the Roman Catholic Diocese of Orange said it was considering buying the bankrupt church in Garden Grove and converting it to a Catholic cathedral. The announcement by Orange Bishop Tod Brown came one day after Chapman University made a $46-million bid for the 40-acre site. The Crystal Cathedral had earlier reached a tentative agreement for a sale and lease-back deal with a real estate developer, subject to approval by U.S. Bankruptcy Court Judge Robert Kwan. A sale to the Catholic Church would solve a longstanding problem for the Orange Diocese, which has no central cathedral for its 1.2-million parishioners. It has been planning for more than a decade to build a new, 2,500-seat cathedral in Santa Ana, but has gotten only as far as hiring an architect. The Crystal Cathedral, designed by the late Philip Johnson, would provide an instant, 3,000-seat architectural landmark at roughly half the $100 million that was previously estimated for the Santa Ana project. Such a deal, however, presumably would mean the end of the Crystal Cathedral Ministry’s tenure on the site — a hard pill for the founding pastor, the Rev. Robert H. Schuller, and the church board to swallow. The bids by both Chapman University and the real estate developer, Greenlaw Partners, would allow Crystal Cathedral ministries to lease back portions of the site, including the cathedral itself. The Crystal Cathedral filed for bankruptcy in October citing more than $50 million in debt. Documents related to the case have revealed generous payouts and tax allowances for church insiders and Schuller family members. Sad to say but animated personalities who create for themselves empires (denomination) eventually lose their sparkle, and when they do, things start to wane – this while the Church that has been with us since Jesus and the Apostles and their successors will continue and continue until the very end of time. Garfinkel is on camera claiming that his site is one of only three main cities in the kingdom of David: Jerusalem, Hebron, and Qeiyafa. Don’t believe it for a second. The CNN title of the video, “Finding the City of David,” and the tagline is inaccurate: “Archaeologists in Israel believe they have found the remains of the legendary City of David.” The story has nothing to do with the “city of David” (Jerusalem), but is all about one border site which appears to date from David’s lifetime. It is hardly legendary. Since the mistake will increase viewers, I wonder if it was unintentional and I doubt it will be corrected. There seems to be no way to embed the video, so you’ll need to click through to watch it. At the bottom of this post I’m linking a copy of the legal pleading by which Fr. Corapi filed suit against his accuser. Although I have unredacted copies of the pleadings in the case, I am including one here that omits the name of the accuser (a) because although the accuser’s name is now widely known, she was outed and has not to date chosen to make significant public statements on the subject and (b) because I do not have the original copies of the pleadings scanned at this point. I may post more, including unredacted ones, in the future. I would call attention to two particular parts of the pleading. A pdf. download of the above document is available here. The whole thing is messy.